Registration for nippers 2019/20 will open in mid-late October and close in mid-December. Specific opening and closing dates will be on this page in early October. We warmly welcome new nippers every year, but please note our places are highly sought after and limited. Registrations will close when an age group is full, so it is highly recommended you apply within the first few weeks of registration opening. Registration is on a first-in first-served basis. ALL Nippers (U7-U14) need to submit a completed Swimming Proficiency Form when registering – even if you have done nippers before. The 2019/20 swim form will be available in early October. Tentative dates for 2019/20 are Dec 28 – Jan 5, with registration on Dec 27. See below for more details. The State Titles are at LORNE 23/24 February 2019, so come and compete or watch the action! Our Junior life savers, aged between 6 and 14, are commonly called ‘Nippers’. Each year we run a fantastic Summer program to educate young life savers and develop their surf life saving skills, knowledge, experience and confidence in the beach environment. Not only will your child have fun and meet new friends they will become part of an iconic organisation that has served the Australian community for over 100 years. Sun Jan 6th: Session 8, followed by award presentations. …and most importantly having loads and loads of fun!! Each age group has an Age Level Manager with one or two assistants. The manager is responsible for the education, training and organisation of the group. Under 12 Sun Smart 1/Basic E.A.R. Under 13 Sun Smart 2/Basic C.P.R. We are a volunteer organisation and we rely on volunteers to help run the program. Nippers is not a child minding service, and we require parents to be active supporters, so please consider volunteering to help while you are on the beach. There are plenty of jobs, many of which don’t require any surf lifesaving experience so if you are able to assist please register your interest via email: nippers@lornesurfclub.com.au and see more details on our Parent Help page. Thanks to those who have already offered to help! We will be in touch closer to the program date. Also note we have a clear code of conduct for responsible behaviour so that everyone gets the most enjoyment amount of their experience. Nippers is run by an amazing group volunteers. Please respect them and their efforts. Competition is offered in a number of different disciplines that not only assists members with maintaining their surf skills but also provides children with a regular physical activity that incorporates fun and teamwork. 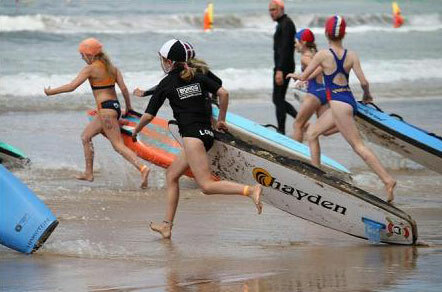 Events for nippers involve swimming, board paddling, and running. Children can also participate in team events that incorporate a number of these disciplines and may also begin to teach the basics on rescue techniques, such as the board rescue event. 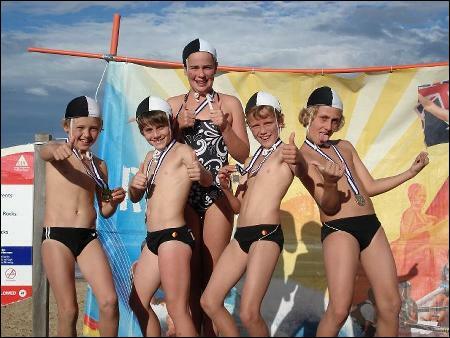 Nippers have a competition calendar each season culminating in the Victorian State Titles. This year 2018/2019 season the State Titles will be held in LORNE on the 23/24 February so we are aiming for a large team representing Lorne. In order to compete at State Titles nippers must compete in their age group at the one or more of the junior carnivals. There are two dates on the calendar which are‘Qualifying Carnivals’ where certain events such as Board and Relays require individuals or teams to qualify to compete at State Titles. The final decision on team members rests with the individual Age Level Managers. We encourage all nippers to wear club bathers throughout the intensive program. Club apparel is compulsory during regional and state carnivals. It is compulsory for all nippers to wear an age level cap and the Lorne nippers rashie during the intensive summer program. Not only does this promote a sense of belonging, but importantly ensures participants are clearly visible to the age group managers and are sun safe. The Lorne nippers rashie is included in your registration kit, and the age group cap is handed out on the first day of the program. Club uniforms and clothing are available for purchase prior to most sessions during the intensive program. All Nippers need to complete a Preliminary Skills Assessment in the pool prior to participating in any water activities in the nipper program. This is to ensure children have a suitable swimming ability to allow them to safely enjoy the water activities of the program. Download this form and complete it for each nipper and have it signed by a qualified swim coach/teacher/pool lifeguard. Then upload the form(s) with your nipper registration(s). Registration will open on this website from approx. 22nd October. We look forward to seeing you at the beach!